KPU Zed Cred: KPU psychology instructor and proponent of open education, Rajiv Jhangiani (Ashley Hyshka). Kwantlen Polytechnic University’s trailblazing Zed Cred program is offering a new diploma for students who haven’t yet graduated from high school. The program is a collection of courses which come with zero associated textbook costs. The first half includes arts courses, which students can take to earn a one-year Certificate of Arts credential or any other arts degree. The program was officially announced in November 2017, but formally implemented in spring 2018. The newest addition to the program is the Adult Graduation Diploma, which was not created by KPU but was awarded on behalf of the Ministry of Advanced Education. This encompasses qualifying courses in English, math, and biology, and is the equivalent of receiving a GED diploma. 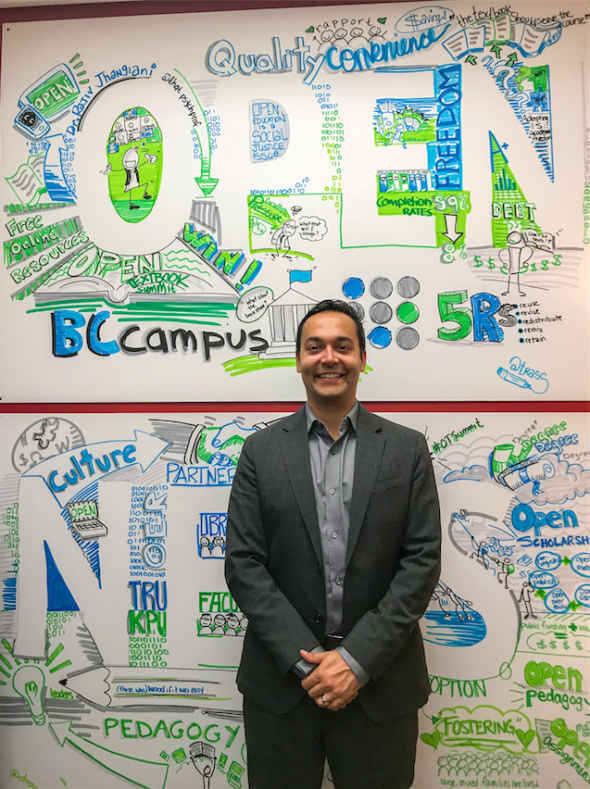 “KPU is the leading institutional adopter of open educational resources in the province and in the country,” says Rajiv Jhangiani, a KPU psychology instructor and the special advisor to the university’s provost on open education. An advocate for the open education resource movement, Jhangiani explains that the Adult Graduation Diploma was incorporated into Zed Cred because it fills an existing need among prospective KPU students. Over the next few years, he expects that at least three new programs will be introduced. Open education textbooks are published under creative commons licenses and can be downloaded for free online. They can also be modified and adapted for individual needs by instructors. He also notes that a quarter of B.C. students are selecting or withdrawing from courses based entirely on textbook costs. The students who are most likely to do this are marginalized, including those in visible minorities or holding student loans, and are more likely to be the first in their family to attend university, according to Jhangiani. The Zed Cred program has received multiple grants from external organizations that are often matched by the university. KPU has received $35,000 in funding from BCcampus, a contribution which was only awarded to two other universities. Amanda Coolidge, Senior Manager of Open Education at BCcampus, says that KPU was selected for this grant because of its commitment to zero-cost materials for its Certificate of Arts. “KPU is a leader in open education both in B.C. and globally, and the time was right for KPU to make the transition from single open textbook adoptions to a full certificate pathway,” she says. “There’s nothing more infuriating than spending that $200 [on a textbook] which, what, translates into how many extra hours working a minimum wage job?” asks Jhangiani. Many instructors at KPU have also been supportive of the program. Some are writing their own OER textbooks, while others have adopted pre-existing ones. Separate universities across Canada have even approached KPU asking for help in implementing their own Zed Cred programs, according to Jhangiani.